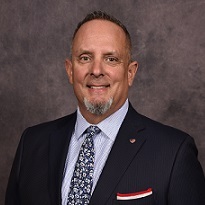 Michael Kalinich began working as Senior Vice President of Corporate Partnerships for the Greater Orlando Sports Commission in November 2018, where his responsibility will be to develop and manage the GO Sports corporate partnership network. Prior to joining GO Sports, Kalinich enjoyed a successful five year career in the same capacity for the Orlando Solar Bears professional ice hockey team. Under his leadership, the team’s corporate partnership sales tripled during his tenure. Kalinich and his family moved to Orlando in 2013 from Binghamton, New York where he flourished as Assistant Athletic Director of Corporate Partnership at Division-I Binghamton University. Like his accomplishment with the Orlando Solar Bears, Kalinich was able to triple corporate partnership revenues during his five years at Binghamton. He lists his fondest moment as traveling to watch the BU Bearcats men’s basketball team take on the Duke Blue Devils during the 2009 NCAA Tournament. Prior to making the transition into sports, Kalinich owned and operated Sawtelle Travel Service – American Express. Under his direction the company grew and earned numerous prestigious honors including the American Express Travel Representative Excellence Award as one of the top-20 travel agencies in the country. The company was also recognized by the Press & Sun Bulletin as the region’s premier travel agency for 11 consecutive years. Kalinich served on many local boards including the Binghamton Regional Airport, Broome County Arena and the Broome Sports Foundation. He proudly served as an advisory board member for American Express Travel as well as for Traveling Times, Inc. out of California. Kalinich graduated from Susquehanna Valley High School and SUNY Broome Community College. He played numerous sports growing up including football, basketball and baseball and settled on ice hockey in college where he was named the Broome Hornets Most Improved Player during his final season. He furthered his education with a series of travel industry short-courses in New York, Dallas, Chicago, Kansas City, Phoenix and Los Angeles and eventually earned a degree as a Certified Travel Consultant from the Wellesley Institute in Massachusetts. Without a doubt, Kalinich lists his family as his greatest accomplishment. He and his wife Mylene Serrano-Kalinich have been married for 18 years and have two sons, Michael (13) and Maxwell (10). The boys, like their dad, are avid sports fans and participate in school and travel baseball. Mylene is a Vice President Wealth Advisor at BB&T Bank. The Kalinich family loves to travel and attend sporting events as often as possible.